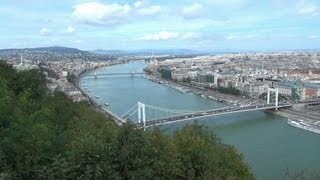 N 47° 29' 52" and E 19° 2' 23"
Budapest in Budapest with it's 1,741,041 citizens is a town in Hungary. It's the capital of this country. Current time in Budapest is now 09:28 PM (Monday). The local timezone is named Europe / Budapest with an UTC offset of 2 hours. We know of 11 airports near Budapest, of which 4 are larger airports. The closest airport in Hungary is Budapest Listz Ferenc Internationall Airport in a distance of 11 mi (or 18 km), East. Besides the airports, there are other travel options available (check left side). There are several Unesco world heritage sites nearby. The closest heritage site in Hungary is Budapest, including the Banks of the Danube, the Buda Castle Quarter and Andrássy Avenue in a distance of 2 mi (or 3 km), South-East. Looking for a place to stay? we compiled a list of available hotels close to the map centre further down the page. When in this area, you might want to pay a visit to some of the following locations: Budakeszi, Szigetszentmiklos, Erd, Dunakeszi and Gyal. To further explore this place, just scroll down and browse the available info. Let's start with some photos from the area. Apaczai Csere Janos u. 4. Sky is clear, moderate breeze, clear sky. A short film from the Szechenyi Baths in Budapest, Hungary. Shot on a GoPro Hero 3 Subscribe please! Tweed Run Budapest 2014. 04. 05. During my one week stay in budapest i made this time/hyperlapse All rights to DMM studios. little skatetrip in budapest facebook: https://www.facebook.com/ascherluigi.ascher. Highlights from the Judo Grand Prix in Budapest, Hungary June 21st - June 22nd, 2014. 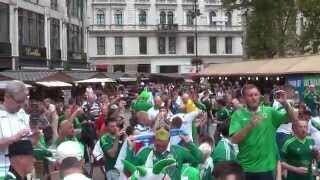 Northern Ireland's Green And White Army (GAWA) in full voice in Budapest ahead of the 1-2 victory over Hungary September 2014. Off Key and off the scale - stay with it for the air guitar at the end. The Constitutional Court of Hungary (Hungarian: Magyar Köztársaság Alkotmánybírósága) is a special court of Hungary, making judicial review of the acts of the Parliament of Hungary. The official seat of the Constitutional Court is Budapest. Until 2012 the seat was Esztergom. The Constitutional Court is composed of 15 judges since September 1, 2011 (previously, the Court was composed of 11 judges). The members then elect the President of the Court from among its members in a secret ballot. Located at 47.5037, 19.0365 (Lat. / Lng. ), about 0 miles away. The Hungarian Academy of Sciences is the most important and prestigious learned society of Hungary. Its seat is at the bank of the Danube in Budapest. Located at 47.5013, 19.0463 (Lat. / Lng. ), about 0 miles away. Inner City is part of the historic old town of Pest. Today it is a part of the 5th District of Budapest, Hungary. Budapest's main shopping street, Váci utca ("Váci Street"), is located there, as is a large part of the city's commercial life, banks and travel agencies. Many tourists start sightseeing there. In a broader sense, the city centre of Budapest is bordered by the Grand Boulevard on Pest side of the city. Located at 47.498, 19.04 (Lat. / Lng. ), about 0 miles away. The Széchenyi Chain Bridge is a suspension bridge that spans the River Danube between Buda and Pest, the western and eastern sides of Budapest, the capital of Hungary. Designed by the English engineer William Tierney Clark, it was the first permanent bridge across the Danube in Budapest, and was opened in 1849. Located at 47.4989, 19.0436 (Lat. / Lng. ), about 0 miles away. Krisztinaváros is a neighbourhood in central Budapest, situated just west of Castle Hill, north of Tabán. It is named after Archduchess Maria Christina, daughter of Maria Theresa, who interceded for buildings to be erected in this area. The history of Krisztinaváros is inseparable from that of the neighboring old Tabán, Naphegy and Gellérthegy. The central features are Krisztina tér and the entrance to the Castle Hill tunnel. It is also home to the Tabán Cinema http://www. artmozi. Located at 47.4967, 19.0319 (Lat. / Lng. ), about 0 miles away. The Zero Kilometre Stone is a 3 m high limestone sculpture in Budapest, forming a zero sign, with an inscription on its pedestal reading "KM" for kilometres. This stone marks the reference point from which all road distances to Budapest are measured in the country. The reference point had initially been located at the threshold of Buda Royal Palace, but was moved to its present location by Széchenyi Chain Bridge when the crossing was completed in 1849. Located at 47.4981, 19.04 (Lat. / Lng. ), about 0 miles away. The National Széchényi Library (Hungarian: Országos Széchényi Könyvtár) (OSZK) is a library in Budapest, Hungary. It is one of the two Hungarian national libraries, the other being the University of Debrecen Library. Located at 47.495, 19.0392 (Lat. / Lng. ), about 0 miles away. Tabán usually refers to an area within the 1st district of Budapest, the capital of Hungary. It lies on the Buda (i.e. Western) side of the Danube, to the south of György Dózsa Square, on the northern side of Elisabeth Bridge and to the east of Naphegy. Outside of Budapest, several other Hungarian cities and towns also have districts called Tabán. Located at 47.4917, 19.0386 (Lat. / Lng. ), about 0 miles away. Batthyány Square is a town square in Budapest. It is located on the Buda side of the Danube directly opposite the Hungarian Parliament Building. It is named after Lajos Batthyány, the first Prime Minister of Hungary, and a statue for him was erected in 2008. Batthyány Square is noted for the Szent Anna-templom (Church of Saint Anne), a Roman Catholic church built between 1740 and 1762, and one of Budapest's most beautiful baroque buildings. The square is also known for its market hall. Located at 47.5062, 19.0386 (Lat. / Lng. ), about 1 miles away. Várhegy is an area of Budapest, Hungary, located in the I. District of Buda Castle. Located at 47.4972, 19.0383 (Lat. / Lng. ), about 0 miles away. The Halászbástya or Fisherman's Bastion is a terrace in neo-Gothic and neo-Romanesque style situated on the Buda bank of the Danube, on the Castle hill in Budapest, around Matthias Church. It was designed and built between 1895 and 1902 on the plans of Frigyes Schulek. Between 1947–48, the son of Frigyes Schulek, János Schulek, conducted the other restoration project after its near destruction during World War II. Located at 47.5017, 19.035 (Lat. / Lng. ), about 0 miles away. Gresham Palace or Gresham-palota, located in Budapest, Hungary, is an example of Art Nouveau architecture in Central Europe. Built in the early 1900s, it is now owned by an Irish company, Quinlan Private, and managed by Four Seasons Hotels. Located at 47.4997, 19.048 (Lat. / Lng. ), about 0 miles away. Matthias Church is a church located in Budapest, Hungary, in front of the Fisherman's Bastion at the heart of Buda's Castle District. According to church tradition, it was originally built in Romanesque style in 1015. The current building was constructed in the florid late Gothic style in the second half of the 14th century and was extensively restored in the late 19th century. It was the second largest church of medieval Buda and the seventh largest church of medieval Hungarian Kingdom. Located at 47.5019, 19.0342 (Lat. / Lng. ), about 0 miles away. The Hungarian National Gallery (also known as Magyar Nemzeti Galéria), was established in 1957 as the national art museum. It is located in Buda Castle in Budapest, Hungary. Its collections cover Hungarian art in all genres, including the many nineteenth- and twentieth-century Hungarian artists who worked in Paris and other locations in the West. The primary museum for international art in Budapest is the Museum of Fine Arts. Located at 47.4961, 19.0397 (Lat. / Lng. ), about 0 miles away. MTI is a Hungarian news agency. One of the oldest news agencies in the world, it was founded in 1880. MTI is owned by MTI Rt. , founded by the Parliament. The members of the Owners’ Advisory Body are elected by the National Assembly of Hungary on four-year terms. It's a marketleader, and is considered by some sources to be a ‘balanced and reliable source’. Still, it finds it difficult to raise subscriptions as most major Hungarian newspapers are foreign-owned. Located at 47.4934, 19.0341 (Lat. / Lng. ), about 0 miles away. The Shoes on the Danube Promenade is a memorial concept by filmdirector Can Togay and was created by him and the sculptor Gyula Pauer on the bank of the Danube River in Budapest. It honors the Jews who were killed by fascist Arrow Cross militiamen in Budapest during World War II. They were ordered to take off their shoes, and were shot at the edge of the water so that their bodies fell into the river and were carried away. It represents their shoes left behind on the bank. Located at 47.5039, 19.0448 (Lat. / Lng. ), about 0 miles away. The Budapest Castle Hill Funicular or Budavári Sikló is a funicular railway in the city of Budapest, in Hungary. It links the Adam Clark Square and the Széchenyi Chain Bridge at river level to Buda Castle above. The line was opened on March 2, 1870, and has been in municipal ownership since 1920. It was destroyed in the Second World War and reopened on June 4, 1986. A feature of the line are the two pedestrian foot bridges which cross above it. Located at 47.4978, 19.0393 (Lat. / Lng. ), about 0 miles away. The interiors of Buda Castle, the former palace of the Hungarian kings in Budapest, Hungary, were all destroyed during World War II and the post-war reconstruction. There is very little data about the interiors from the medieval and Baroque era. However, the turn-of-the-century palace was meticulously recorded with detailed descriptions, photographic documentation and grounds plans. Batthyány tér is a station on the M2 (East-West) line of the Budapest Metro. It is located under Batthyány Square in Buda, immediately on the right bank of the Danube river. Next to the station, there is the southern terminus of the Szentendre HÉV suburban railway. On the surface, there is a mall next to the metro entrance, as well the square itself. The station has two tram connections, to 19 and 41. Located at 47.5065, 19.0386 (Lat. / Lng. ), about 1 miles away. Buda Castle and its gardens have been decorated with works of art since their foundation in the 14th century. Only written sources speak about the most important medieval works, but detailed pictorial and written information exists about the 19th century artistic decoration of the palace which was mainly created by the most important Hungarian artists of the turn-of-century. 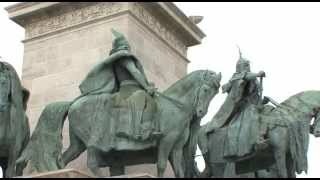 Many of the statues survived the destruction during the siege of Budapest in 1944-45 and they were restored later. The InterContinental Budapest Hotel is located on the Danube bank and surrounded by some of Budapest’s landmarks, such as Széchenyi Chain Bridge, the former Royal Palace and the Parliament Building. Located at 47.4981, 19.0476 (Lat. / Lng. ), about 0 miles away. The Sándor Palace in Budapest, Hungary is the official residence of the President of the Republic of Hungary and the seat of the Office of the President of the Republic, both since January 22, 2003. Sándor Palace is the 37th biggest palace in present-day Hungary. The palace is situated at Szent György tér 1-2 in Buda, immediately north of the Buda Castle complex, which was the former residence of the kings and governors of Hungary. Located at 47.4978, 19.0378 (Lat. / Lng. ), about 0 miles away. The Court Theatre of Buda (natively Várszínház) is Hungary's oldest functioning, and Budapest's first theatre. It was built in 1763 as a Carmelite church and monastery, and was converted to a theatre in 1787. The theatre was home to the first play in Hungarian language in 1790. Located at 47.4983, 19.0378 (Lat. / Lng. ), about 0 miles away. The Rácz Thermal Bath, located in Budapest, Hungary, is an 8000 sqm bath and is renowned for its Turkish Bath dating back to the 16th century and also its Imperial pools and Shower Corridor built in the age of the Austro-Hungarian Monarchy. The bath is listed as a UNESCO World Heritage and is now part of the newly built complex of the Racz Hotel & Thermal Spa. Located at 47.4906, 19.0433 (Lat. / Lng. ), about 1 miles away. The Labyrinth of Buda Castle was the biggest and the best-arranged part of the cave system under Buda Castle that could be visited. It first gained international reputation in 2000, when it was ranked among the 50 most interesting places of the world, thanks to the program “Labyrinth of Lanterns”. Until its closure in 2011 it was among Budapest's Top 10 most famous and visited cultural attractions, and was regarded as one of the 7 underground Wonders of the World. http://weburbanist. Located at 47.5, 19.0342 (Lat. / Lng. ), about 0 miles away. These districts belong to Budapest. These are districts that are close by, but belong to a different city than Budapest. These are some bigger and more relevant cities in the wider vivinity of Budapest. These are the most popular locations in Hungary on Tripmondo.